Can you help NJ McCall take revenge? 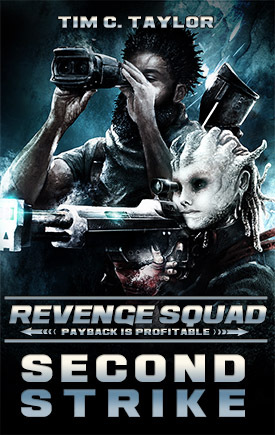 As I type these words, After War, the first book in the forthcoming Revenge Squad series is due to be launched in about a month. Nervous? You bet! Excited? Oh, yes! And as a Legionary, you can read the recon team edition today. “When it had no further use for me, the Legion dumped me on a frontier world and told me to be a good colonist. And what happened next will change the world. But that’s dull. You don’t want to hear about corrupt politicians, secret cabals, and revolution. It’s what happened to me, NJ McCall, that you won’t believe. 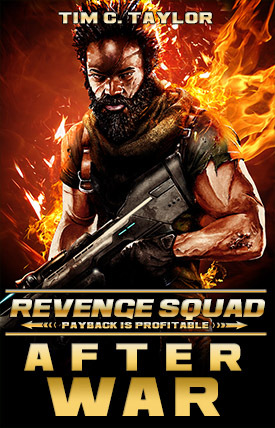 For a start, I joined Revenge Squad Inc.
After War features a hero who is also something of a grumpy old soldier. I claim personal experience in two of those conditions, but I've not been a soldier so I may have written something that doesn't sound right to someone with that background. Donna the Editor and I are both English. This means we wear powdered wigs, commute to work on a red bus, and only take off our bowler hats when bathing. Despite scurrilous rumors spread by JR Handley, it most definitely does not mean we drink warm beer. Damn you, rest of the world! British beer is served at cellar temperature, I tell you. As God intended. However, it also means we might fail to spot something that seems off to our North American and Australian readers. I've set up a BattleNet forum to discuss anything you find. It's here. For more details on suggestions and help on how to go about it, see the recent recon team announcement here. If you've been a Legionary for a while then you've seen this info before and I don't want to repeat myself too often. I'm sure you don't either. After War: Retired onto a frontier planet and told he's now a colonist, NJ McCall is lost in every sense when a filthy alien penetrates the perimeter of his farm. What happens next will change the world. Hurt U Back: NJ McCall's first assignment is to Port Zahir, and it does not start well. The Revenge Squad HQ is abandoned, its personnel assumed slaughtered. But NJ's new family will not let him give up. Battling through dockside rivalries, revolutionary intrigue, police harassment, and an ex-fighter pilot turned bishop with an eye on his soul, NJ must face overwhelming odds if he is to deliver his revenge. The eBook edition will initially be exclusively available to Legionaries. That should be plenty for one month. We're not idle though. We will be back with more releases in 2017. 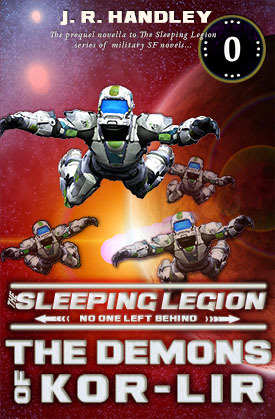 The next Sleeping Legion novel, Operation Breakout, is well underway. The next Revenge Squad novel., Second Strike, has been outlined, and the opening scenes written of the final Human Legion novel, The Battle of Earth. Deeper into 2017 will see more Sleeping Legion and Revenge Squad novels and exclusive content as part of the first Human Legion box set (which will be available on Kindle Unlimited, so anyone with a subscription can get it free). Copyright © 2016 Human Legion Publications, All rights reserved.